This entry was posted on Wednesday, August 6th, 2014 at 11:03 am	and is filed under Arduino, hacks. You can follow any responses to this entry through the RSS 2.0 feed. You can skip to the end and leave a response. Pinging is currently not allowed. Very cute. I notice his LED is doubling as the reset pullup, but in that case the LED is reverse biased. I guess it works because there is almost no current flowing with that pin as an input, but it seems a bit dicey. The LED is never reverse biased. Care to elaborate? Oops, of course you’re right, the LED could only be reverse-biased if the cathode end was higher than Vcc, which it can’t be in that circuit. It is always forward biased, or at most unbiased if that pin was an output driven high. There might be some question about the forward voltage drop across the LED leaving the reset pin a bit low for comfort (especially if it was eg. a blue LED), but I guess at basically zero current, Vf is pretty low. Ok :) I was already worried about having missed something. Sorry, it doesn’t add much to discussion, but that is fantastic! I think you should produce it and put it out through someone like Seeed Studio or Adafruit. What would you do about the lack of pins? Following on JBeale’s reply, embedded engineers like to use the minimal part for tightly focused embedded applications, because we are supposed to optimize products. For example, there was an 8 pin MCU in a new air cooler I opened up the other day. It probably cost much less than USD1. Of course, this kind of thing may be meaningless to many hobbyists. Neither side’s stance is wrong. But it’s second nature to engineers doing product design, in the same way Woz is very proud of his designs and optimizations. I stock up on MCUs from DIP8 to TQFP64, I will use the <USD1 MCU in a hobby project when I don't need anything bigger. 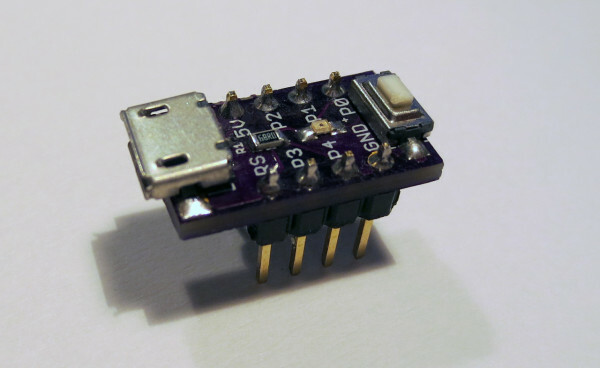 Low pin count is the whole point of the ATtiny85 and other 8-pin micros. Some applications fit into this, for example a proportional-control thermostat might need just one ADC input and one PWM output. You could even do three independent thermostats at once in this form factor, because there are 6 GPIO and 4 of the pins can be 10-bit ADC inputs, and all 6 I/O pins can be used as PWM outputs. Now, if you want 12 PWM outputs plus other I/O to drive a 3-axis CNC tool, then you would be choosing a different chip.